K-State’s Prairie Bloom list includes flowers that are tested for 3-5 years. OLATHE, Kan. – Meringue, Merlot and Bravado all have one thing in common. So do Hot Papaya, Ruby Giant and Lucky Star. They’re all cultivars of Echinacea, also called coneflower, and they’re all on Kansas State University’s new Prairie Bloom list of recommended perennial flowers. Flowers that make the list have exhibited superior performance for three to five years or more in K-State’s bedding plant research trials in several locations around the state. The Prairie Bloom list is available online at Prairie Bloom Perennial Flowers. “New this year are cultivars of peonies, crepe myrtle and forsythia,” said Robin Ruether, coordinator of the Prairie Bloom (perennial) and Prairie Star (annual) programs. The new list is separated by those that grow best in the sun and those that prefer shade. Such flowers as asters, carnations, daylilies, irises, and ornamental grasses are included, as are hostas, shrub roses, and others. Each cultivar’s color, average height, width, and first week of bloom are also noted. Prairie Bloom is not a commercial brand or product line, Ruether said. It’s a list made up of flowering plant varieties submitted for testing in the sometimes harsh prairie climate. Those that grow well – and not all of them do – make the list. 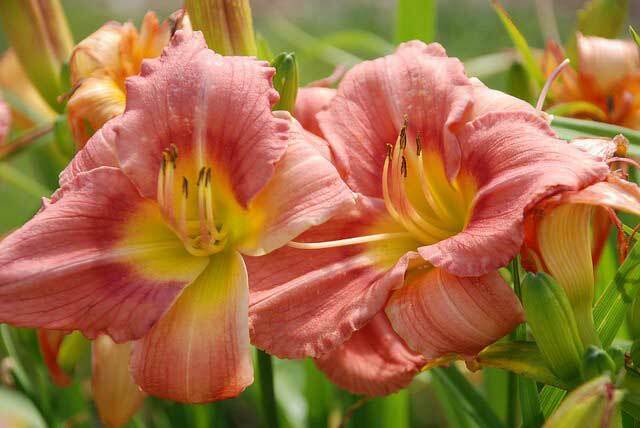 Ruether encourages gardeners to use the list to shop for specific varieties – not a generic daylily, but the daylily variety ‘Rosy Returns,’ for example. More information about the Prairie Bloom and Prairie Star Flower programs is available at Prairie Star Flowers.